There’s nothing funner than playing with food. Well, playing with food with your kids. That’s fair, right?Not that I wouldn’t play with my food without them (I kinda did that before I became a mom, but that’s another story), but with them, its kind of like I have permission. Because that’s what moms do, right, get permission from their kids to play with their food? Right? 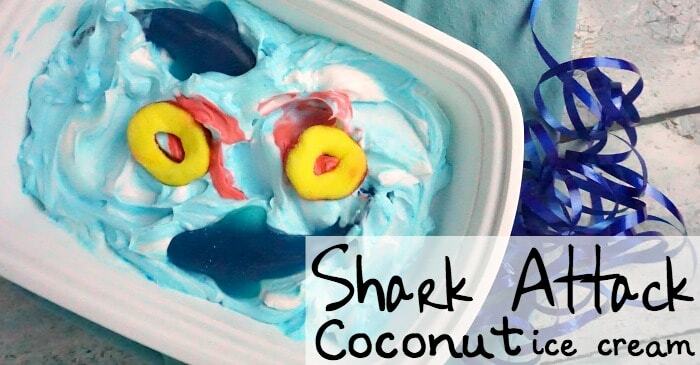 Oh, wait…Well, now maybe I’m just a little embarrassed that I made this Shark Attack Coconut Ice Cream. But, it’s vegan & gluten-free, so that’s worth something, right? I picked-up a bag of these ridiculously cute giant gummy sharks and, sitting right beside them were these gummy peach-circles. Well, dern it if they didn’t look like they went together?! I mean–life savers that were the perfect size for those sharks? And thus the idea for the Shark Attack Coconut Ice Cream was born. Because empty life preservers being circled by sharks in a little bloody water? 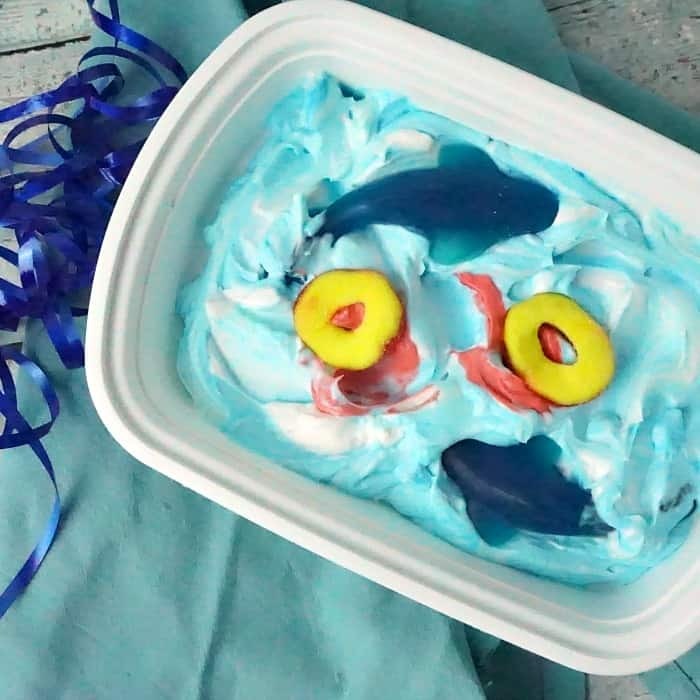 How could that NOT be the most perfect snack for Shark Week? So, I’d like a little round of applause for pulling this together in less than 10 mintues. I mean, ice cream that happens that fast is just–well, brilliant. And, even better, for it to be a little shark attack scene? Awesome. Even better that it’s like a symphony of coconut and gummy and everything right in the world. I’ll take this coconut ice cream, even if it isn’t shark-ified. But, sharky? Yup, that bowl is mine. 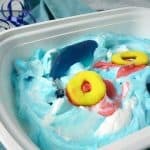 I'm just a little embarrassed that I made this Shark Attack Coconut Ice Cream. But, it's vegan & gluten-free, so that's worth something, right? Add the powdered sugar and coconut flavoring. Split the mixture 3/4 to 1/4. Mix a few drops of blue food coloring into the 3/4 mixture. Spoon blue mixture into a bowl you can freeze this in. Drop the white on top in clumps, then kind of stir it a little--but more just touch it and mush it around to make waves. Take the last dregs of white and put some red food coloring into it. Dab that red on top in a couple of places. Put the lifesavers--I mean, peach gummy circles, on top of the red. 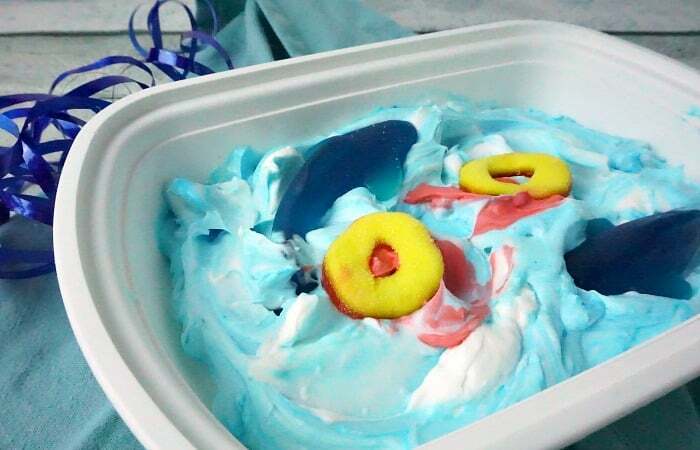 Place the sharks on the ice cream in a cute little "circling the life preservers" kind of way. Then, place it in the freezer for 2-4 hours--but not too long, you don't want those sharks to get lonely. Remove from freezer and let the shark-circling begin!